That's how I am feeling this morning. Whatever is going through our house just won't go away. Today, I can't talk. Can't breathe. Can't get my eyes to stop watering. Bleck.We have another showing today and I am not sure I can get up the energy to clean up my kitchen. K and I did a lot of cooking and baking last night. We made my mom's Beef Stroganoff recipe and then K made this recipe. My mom used to make a cake like this and I haven't had it in a long time. I was NOT too sick to sample a bit. :) It was delish. Needless to say though, after letting my 11 year old bake last night, my kitchen needs some help. I think I may sit by the fire and read for a bit before I attempt to clean the kitchen. I have had a little bit of time to read lately and have read some really good books. I just finished The Handmaid's Tale for my book club. It was such a good book with so much to think about. Will definitely give us so much to talk about. I also just finished the Book Thief. Really liked this one too. The main character was a girl who grew up in Germany during Hitler's reign. Which gave K and I a lot to talk about since they are studying WWII at school right now. I have just started the Girl in the Tangerine Scarf which was recommended by one of the woman in my book club. I am only about 30 pages in so I can't really give a good recommendation but it is interesting to me since it takes place in Indiana. Will let you know on this one. I will probably have some time to read once we move since I most like not start volunteering a whole lot until next school year. I would love some book recommendations. What are some of your favorite books? I wanted to post today though so I could share this project I created for the color challenge over at Emma's Paperie. 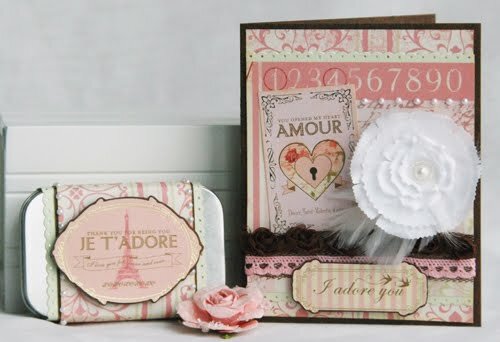 Although I believe that those lovely Je t'Adore papers and and stickers by Making Memories are already sold out. If you are looking for the other supplies I used you can find them here. Thanks for stopping by today and have a wonderful weekend! Sitting by the fire and reading sounds wonderful. :) And beautiful work! Love reading too. Handmaids Tale was the last thing my Mom ever bought me. I was 24. It was 24 years ago, and just before she passed away. GREAT book. Any of Margaret Atwood's books are good. She lives not far from me. If you like that book... Any of the Clan of the Cave Bear series. Start with Clan of the Cave Bear... and you will LOVE LOVE LOVE that series. I promise!!! There are 7 in the series, I think. WOW. Thanks for sharing the book titles! I am going to check them out now :-) Hope you feel better soon!! A good book and a fire always helps! You are invited to follow my blog. Sitting by the fire and reading? Sounds amazing! So sorry you've been down and out,my friend! I hope you're feeling better. LOVE your gift set. That MM line has been one of my favorites this year. You have used it beautifully! !